Actually, yes, I do. I was thinking I didn't like my choices. To me skiing is uncontrolled falling down a frozen mountainside, hurtling toward trees and humans who don't get out of the way. "Tubing" isn't much better and sounds vaguely dirty. I considered the zip-line forest tour. Online comments included: "amazing! ", "so much fun!" and "do it!" But flying through the air in a Canadian winter? Sounds cold. Skip it. But then while packing I realize I have some excellent winter clothes. It dawns on me that the cold problem is solvable. And I do like trees and forest. That's how, when at the last minute there is a cancellation, I end up on the zipline tour. What am I thinking as I get into the van to go up into the mountains? That I've solved the cold problem. With layers. Clever, me. We walk into the woods under towering snow-clad hemlock pines. We cross a swaying ice-encrusted bridge between two tall trees. It's a bit high up, I realize, looking over the side. But at least I'm not cold. Our first platform is built around a 150 year-old hemlock pine with bark rippled like frozen rivers. Very pretty. I look over the edge. The ground is far away. Very far away. The plan is this: the guide clips your harness to a metal line connecting our tree platform to another one. He opens a gate and you step off into space. The zipline catches your weight. Gravity accelerates you down and then across hundreds or thousands of feet of open air to the other platform. You see the forest in a unique way. Like a bird. It's tons of fun, we're told. I look over the edge again. I don't feel so good. It turns out there are two sorts of people in the world. Those who think heights are cool and do things like parachuting and ziplines, and those who know heights are not cool and don't. My group is made up of the first sort. A bit nervious maybe, but no one is going into a full-blown panic. Except maybe me. I've done ropes courses. Even a bit of ziplining. But somehow the memory of how petrified I was has vanished until this moment. What the hell had I been thinking when I signed up for this? That I would be cold. Having solved that problem, I had somehow missed the other now quite urgent problem: I am about to die. "Hey," I say to John, one of our two guides. "I'm thinking of bailing. What do I need to do to get out of here?" "Oh," he says in his heavy English accent, "you'll be fine!" "Seriously," I say. "I don't want to do this. I didn't realize it would be so --" I know I sound like an idiot now but that's okay. Idiot compares well to dying. "So high." "The next one's a bit higher," he admits, "but you'll be fine! A woman on this morning's run was as scared as you are and she was fine." I don't bother asking how he can possibly know how scared I am. I look over the edge again. This is insane. It's hard to think clearly through my primal, unreasoning terror. My lizard brain is screaming. "Ah, just give it a try!" John says. "You'll like it!" I'm pretty sure he's wrong. The group is going now. Clip on, step off into air. A loud buzzing "zzzzippp-pah!" sound. "Next!" John calls brightly. I want to throw up. I want to grip the railing and never let go. "I don't think I can do this," I tell one of the remaining guys. Only much later do I realize that my ability to speak sensibly despite being wretchedly sick with terror is giving the erroneous impression that I'm actually okay. "Perfectly safe," he says unhelpfully. "I know. I just don't think I can do it. I'm really scared." I can bail on this, I remind myself. Sure, it's trouble for the guides, but that's their problem. Mine is staying alive. "Well," he asks, "what are you scared of?" Good question. If I'm going to bail, I decide, I want to know why. Quick, like a racecar mechanic, I take my mindset apart. It's not the safety; I can see how the harness and redundant clip system works, and the process is pretty safe. It's not the accelleration either, which, while impressive, is no worse than an airplane taking off, something I regularly risk and actually enjoy. It's the height. If this were 10 or 20 feet off the ground, as I absurdly imagined, I'd be okay. It's the stepping off into 80 feet of empty air from a perfectly good platform. I try to reason with my lizard brain, but it's having none of that. An horrific future awaits, it tells me. One by one my group goes -- zipppp-pah! -- off to the other side. I'm a software engineer. I like to solve problems. What's going on in my head is a problem. I don't have time to fix it but can I make a fast patch? A few moments later I have a plan. I still don't want to do this but I do want to see if my brain-hack workaround will fly. So to speak. And my time's up. Step up or bail. I walk to the gate and John clips me onto the line. Now the patch: I shut my eyes and imagine the ground only 10 feet down. My lizard brain is screaming so I do it again. It doesn't believe me, but it can't see anything with our eyes closed, so it can't be sure. 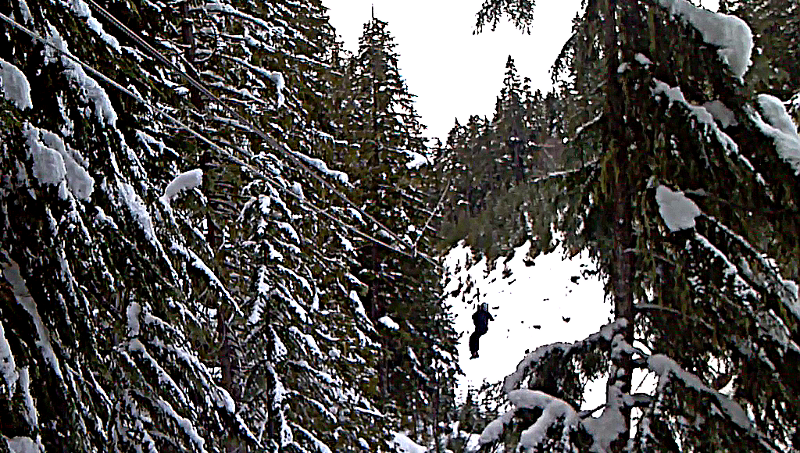 In that split-second of plausibility, I bend my knees, feel the harness catch, and step forward into air. I go. Down and fast. I want to see, so I open my eyes. There's forest sailing by and snow covered land 100 feet below. I'm okay, and oddly, no longer terrified. I was right: it was the step off the platform, not the ride. The brain-hack worked. The next platform starts higher, some 160 feet up, and I'm freshly terrified. So we -- my lizard brain and I -- go through it again: eyes closed, visualize, step forward. Again, enroute, I look around. A river snakes through deep snow banks. Trees fly past. I come to the other side. It gets easier each time. Not easy, but easier. On the final zip I step off with my eyes open to see if I can. Someone takes a picture. While I wouldn't call it fun there's something powerfully satisfying about pushing through impassable terror with a brain-hack I built myself, on-the-spot. That's some cool real-world engineering. As we're driving down the mountain I realize something else: I wasn't cold. Not once. FTW.